Jillian, Isaac, and I went to another estate sale a few weeks ago. I know. Big surprise. Has there ever been a piece of non-descript furniture that you look and look for but just can't settle on one? 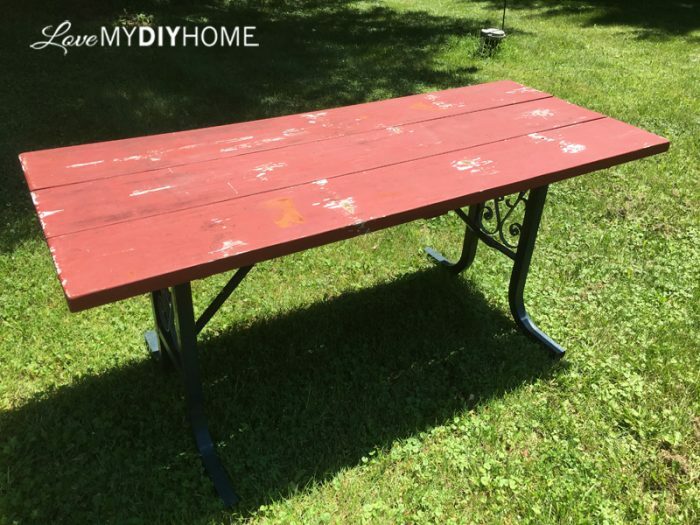 I've wanted a picnic table every since we moved from Michigan to Wisconsin but never found one I was willing to pay for. They're kinda expensive. Or maybe I'm just cheap. But either way...I FOUND ONE! I walked right past it not even noticing it on the way in. We looked around for a few minutes and then got in line o pay for a few little things we found, an ax for Adam, a jack knife for Isaac, a few this's and thats. Then Jillian said, "Hey, did you see that?" She pointed out a picnic table - with a $20 price tag. I walked over and grabbed the tag and got back in line. Not 5 minutes later a lady asked me if I took the tag to the picnic table and I showed her getting an, "Ugh" from her. Some might say that I should leave it as is. First you see a piece of furniture and imagine how it could be "better." If it has aprice tag on it, it gets worst. You imagine buying it and painting it and either keeping it or selling it. If it's a good price, you buy it and take it home, depositing it next to all the other pieces that are waiting to be flipped. 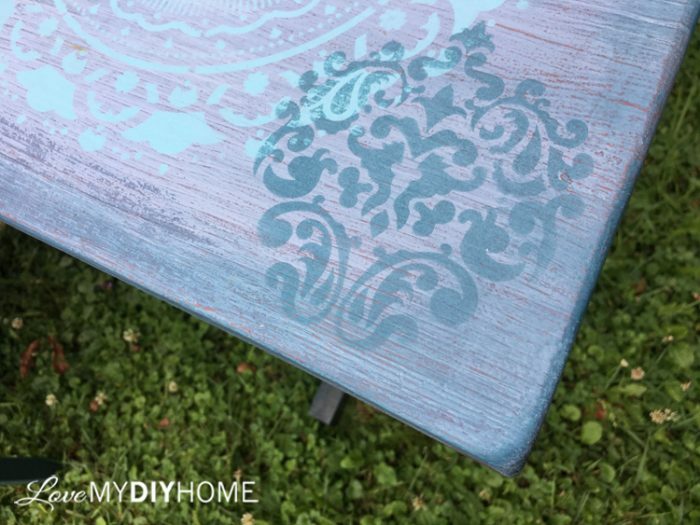 I'll show you how I did it - it was one of the easiest projects I've ever done. Sand it down to get rid of the flaking paint and give you a smoother surface. Wipe it down with a damp rag to get the dust off. 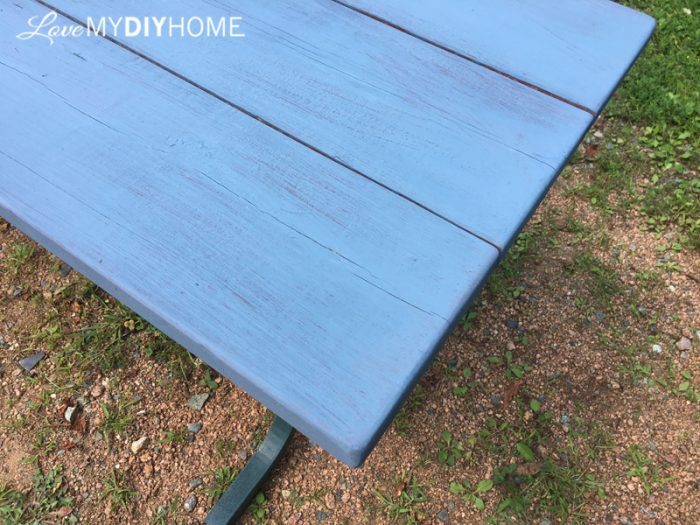 Mix up Old Fashioned Milk Paint - one jar of Soldier Blue and another of the lighter blue, Slate. 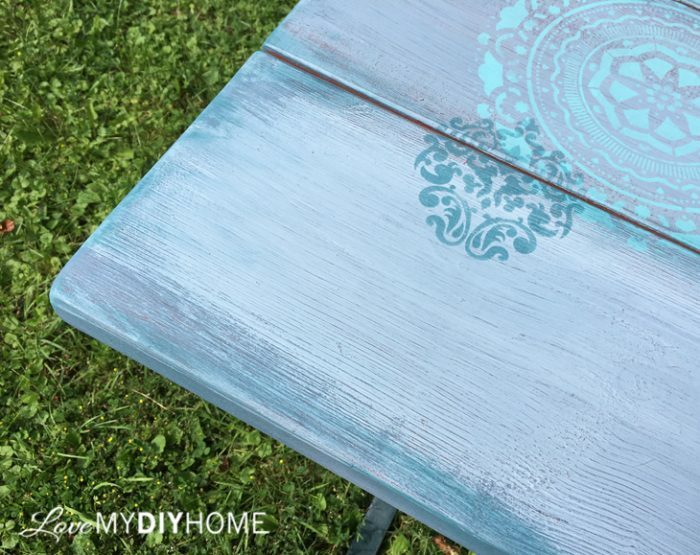 Paint one layer of Soldier Blue and let dry. Let a little of the original red show through. We're going for a layered look. 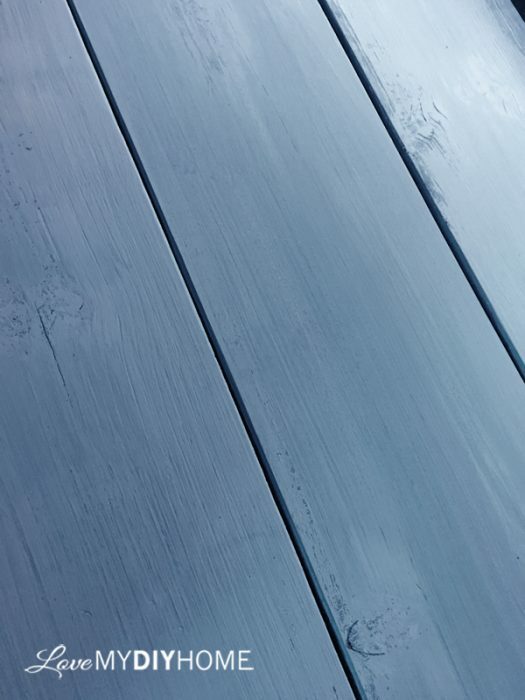 Paint on top of the Soldier Blue the lighter shade, Slate. Distress down to the medium blue and even more to bring out a little bit of the original red. Topcoat with (afflink) Varnish one thin layer to seal the paint before stenciling. 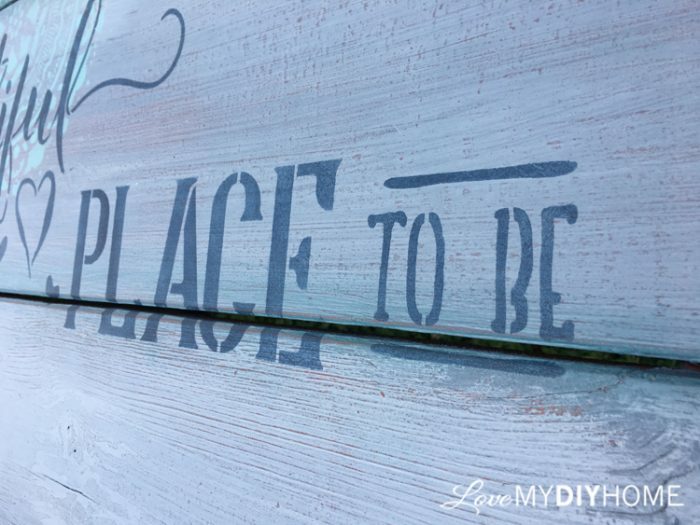 This will provide you with a barrier between the stencil paint and your base coat, protecting it from mistakes. I like to sandwich my stenciled motifs between layers of topcoat. Stencil a couple of different (afflink) motifs all over in coordinating teals, overlapping just a bit. Take a high grit (afflink) sanding sponge and distress both motifs by brushing the sanding sponge over the motifs only one way, lightly. Doing this will give you an instant aged look. 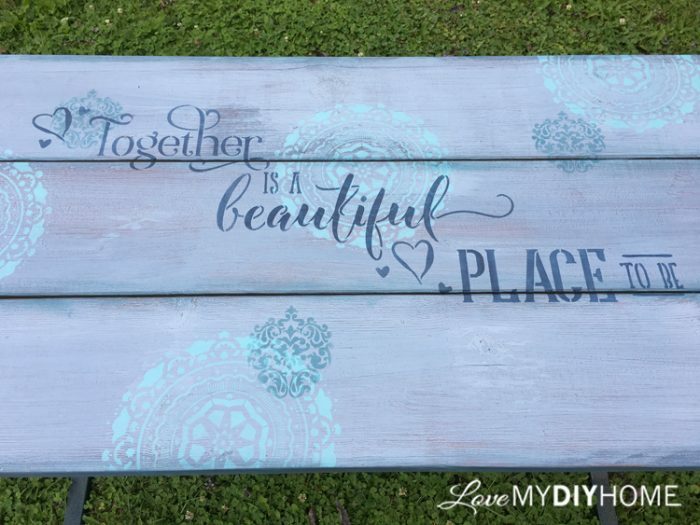 Stencil (afflink) "Together" in the middle, spreading it out to cover more of the table than the original layout. 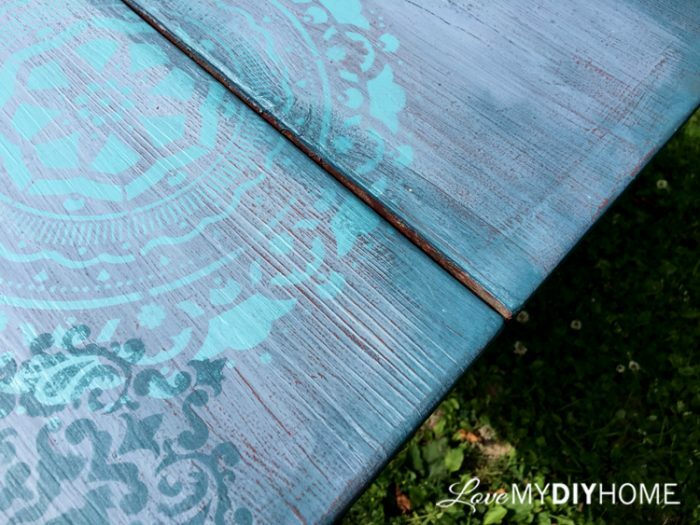 After stenciling the smaller motif, take the brush around the edges of the boards to highlighting all edges to add to the layering. 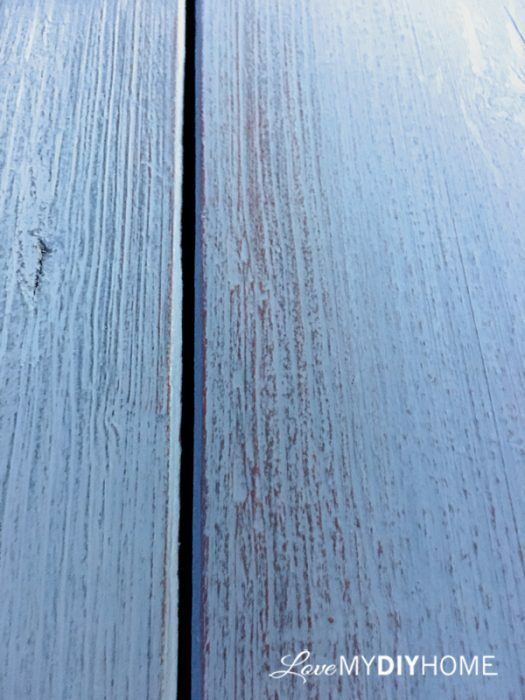 Spray or wipe on on three more coats of (affliliate link) Modern Masters Exterior Dead Flat Varnish, sanding lightly every coat after it dries before applying the next layer. I sprayed one and wiped on two more using my detailer's sponge. **UPDATE** We ended up adding three coats of CrystaLac's Crab Coat to insure it would be protected. We are super impressed with the quality and it went through the summer intact. It is my new go-to product for outside projects. Some would say, "I liked the "before" picture better." Yeah. There is always one who does. But when I find a piece that I don't like and can see it better - can see it in a way that makes me smile inside my head, then I have to make that image real. This time it was super easy. Every once in a while it is. Often I see carefully laid out designs on a piece and think, "I would never try to do that." Though perfection is an unrealistic goal, some of us try to reach it. Too often. But sometimes a controlled randomness is much more desirable. In this case, perfection was imperfection. Randomness actually ends up being my perfection. Do you want to learn how to redesign furniture? 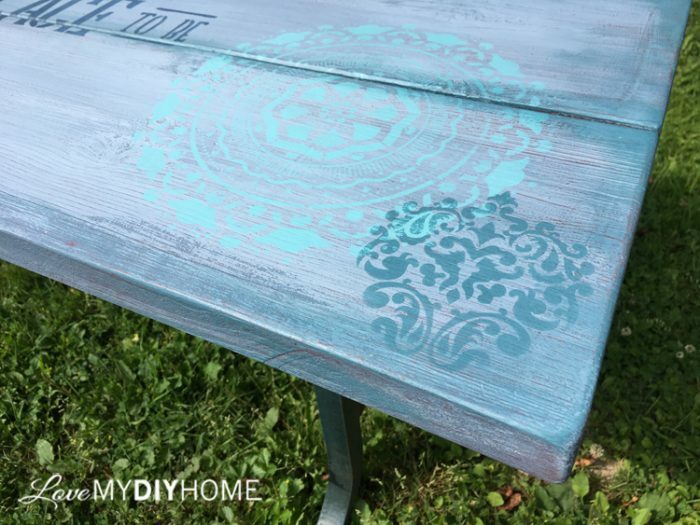 Check into my Furniture Flipping Blueprint- you too can learn how to do projects like this. Enrollment will open soon. Be sure to get on the wait list! Furniture Flipping Forum on Facebook – We are 38,000+ members strong from over 100 countries. Come join us! 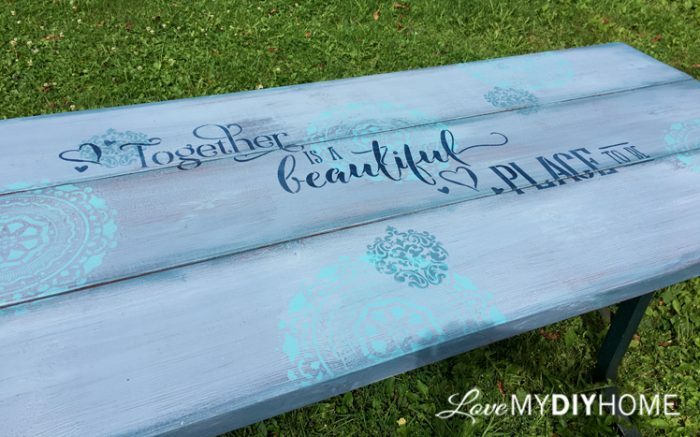 Why paint a picnic table? Because I can! What have you done for yourself lately? Do you take your art outdoors? * Disclosure: This post contains affiliate links. If you buy anything after clicking on one of the affiliate links, I receive a small commission of the sale. The cost to you is the same, and I only link to items that I think would benefit my readers. 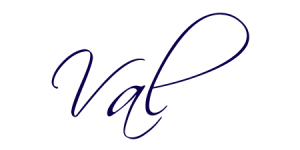 Your support of this blog is greatly appreciated. This was also a sponsored post. 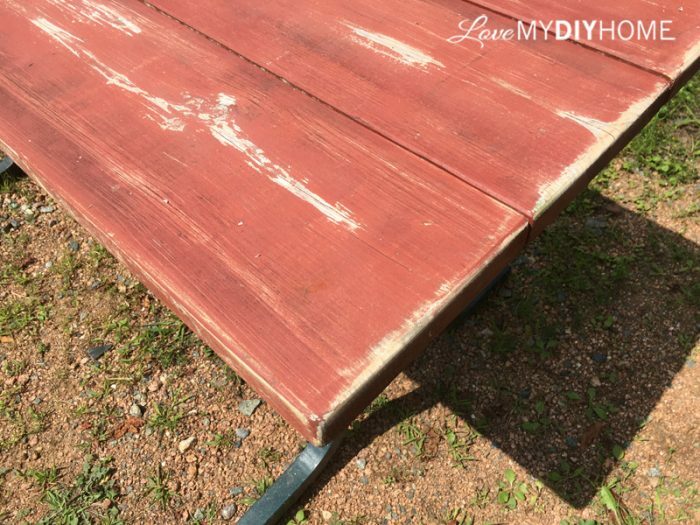 Old Fashioned Milk Paint Company graciously supplied the products to redesign this table in exchange for an honest review. Val you really transformed it. 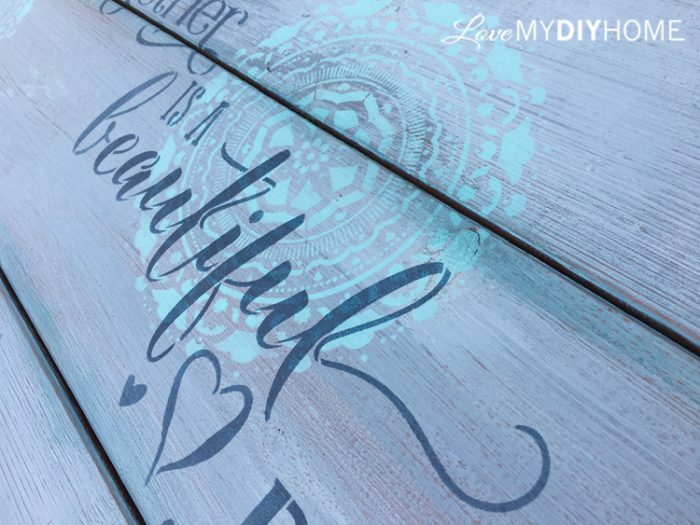 Love the unexpected blue color and all those gorgeously distressed layers. Thanks, Mary! It was such an easy project and I can’t wait to use it! This is beautiful. The color and the design on the top are perfect! You did a great, great job! Thanks, Michelle. I’m coloring outside my box! What a big difference! I love the new look, it turned out beautiful. I like the metal legs on the table. My husband tells me all the time that I'm cheap. But I would of snatched this table up as well, that was a good price. They are expensive. Thanks. I’m cheap too. There’s nothing wrong with that! Really like this re-do! 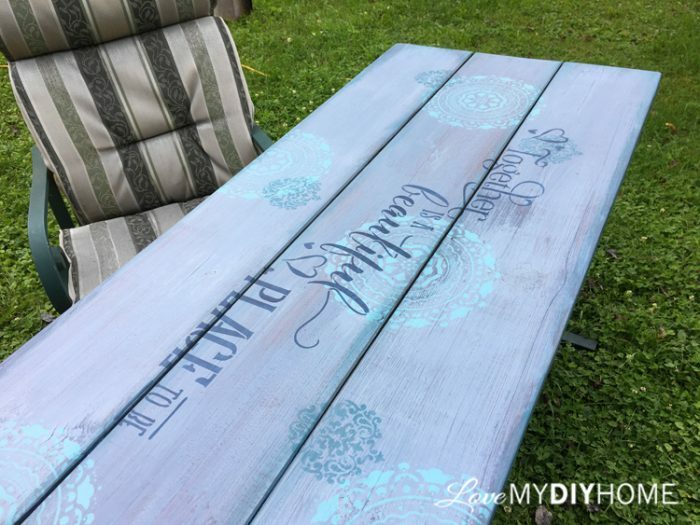 I may try something similar on my picnic table that that is long overdo for a makeover! It was such fun to do. Send me a pic if you do yours! That picnic table is sweet! I have been looking for a picnic table too, haven't found one yet! 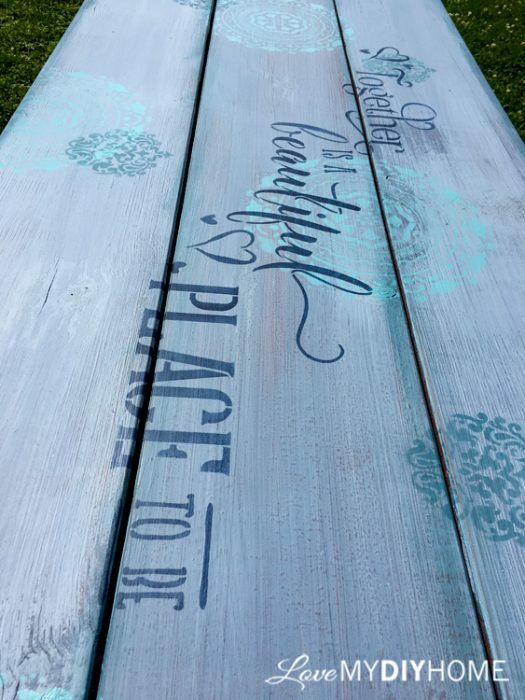 Beautiful job on the picnic table! Thanks, Anita. It was fun to do. 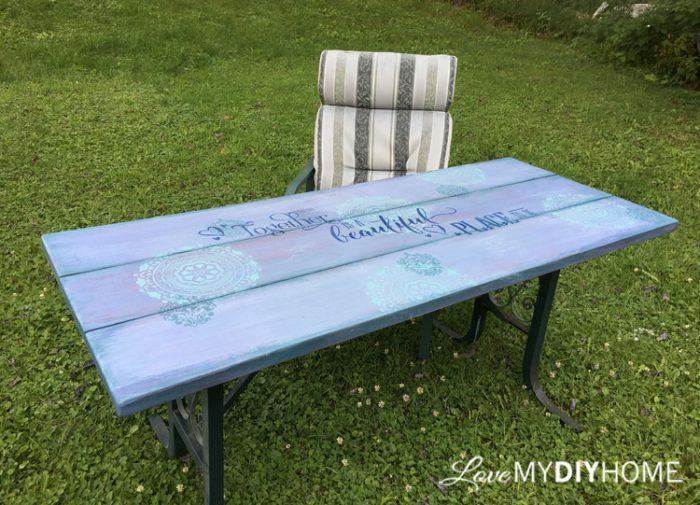 I am inspired to go out and look for an old picinic table just so I can do this! May I suggest the teal blue aderondeck chairs sold at home depot? They are inexpensive and would match your table perfectly! I’ve thought about Adirondacks, but my dh hates them because they sit so low…but maybe I”ll go buy myself one! You did a beautiful job! I love your wording, your colors…I love everything about it. Enjoy!